January 7, 2012 afternoon, the chairman of the board and staff representatives face to face forum, from doors, wheels departments, workshop, station employees attended the meeting on behalf of more than forty. At the meeting, the chairman and the staff cordial conversation, speak their minds, a very friendly atmosphere. Covering all aspects of the production, management, and life. Staff representative said the company last year, under the wise leadership of the board of decision-making and strong, with superhuman courage and boldness, seize the opportunity, courage, to overcome the adverse impact of the financial crisis, the rapid development, efficiency is climbing, and achieved unprecedented splendor performance, I feel very excited and inspired. In seeing the results are keenly aware of the management at this stage is not perfect, the system is not very sound. 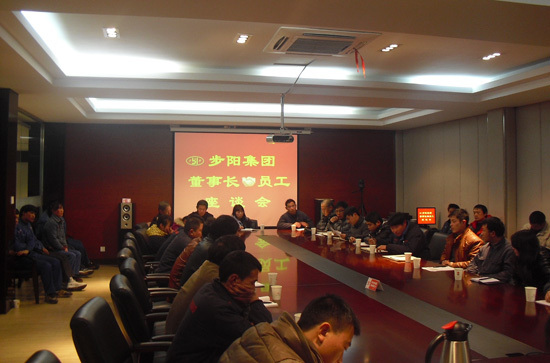 At the meeting the staff representatives on the production, management, assessment, logistics and other aspects of active offer suggestions totaled more than 90, the company in 2012 Policy Development provides some reference.